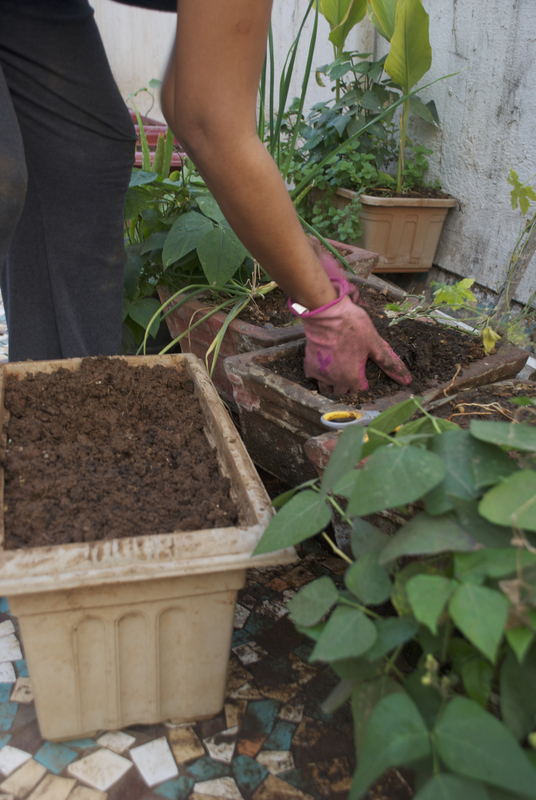 There’s a tone of disbelief in their voices – disbelief that I choose to be getting down-to-earth and dirty in my garden 🙂 Seriously, there seems to be a widespread feeling that manual work is declasse′. Watering your plants, weeding, and god forbid, actually digging your soil, is not something one can be seen doing. It’s too messy, it’s sweat labor, it’s to do with worms and insects and all of that icky stuff. It’s simply not for people-like-us. In other words, it’s something for the low-class maali (hired gardener) to do, under orders from high-class me!! Good earth is not dirty. It’s clean to smell, and warm to the touch – full of the promise of life. First blooms are more glorious to behold when you have worked the soil yourself. First fruit are sweeter to taste when you have nurtured that plant with your own hands – all the way from fragile seedling, through reckless teen growth, into mature adulthood. 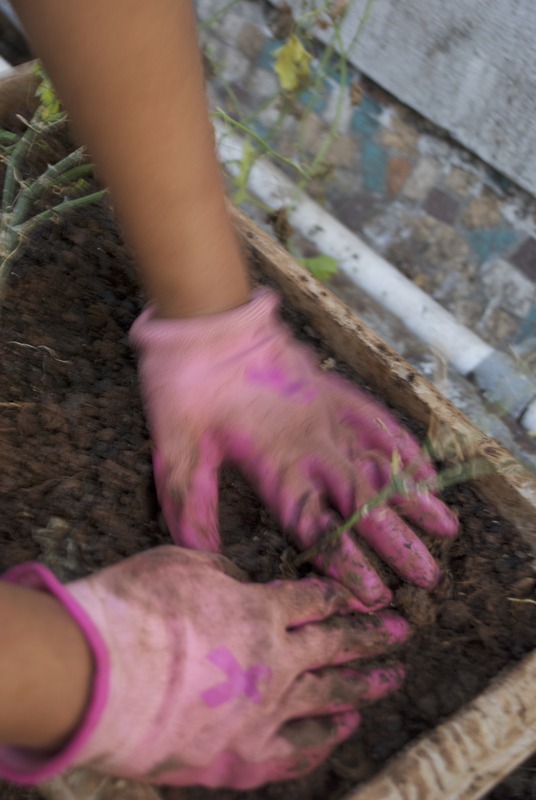 If your soil is wet and wormy, use gloves and just go ahead and do what you have to do. Believe me, you can pull off as good a job as your maali, and feel better for it 🙂 The exercise is also likely to be really good for you, as it is for me! And if you did not need this nugget of wisdom, and are already getting down-to-earth and dirty in your garden, well, then you know how much fun that can be! Here’s me enjoying the earthy experience – giving two sickly karela plants a new home!!! 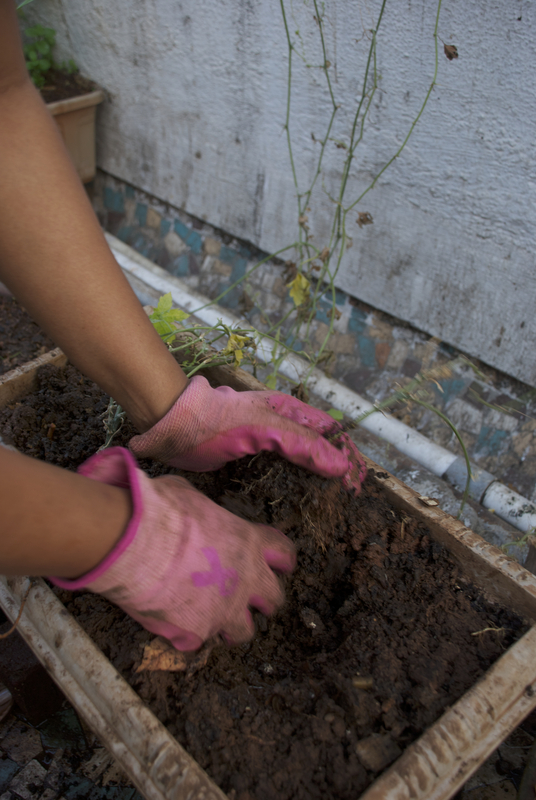 And so until the next post – have fun getting down-to-earth and dirty in your garden! This entry was posted in agriculture, Bombay, city, Container, Farming, flower, Gardening, green, herbs, Hobby, lifestyle, Organic, root, Sustainable, Terrace, Tropical, urban and tagged agri, agriculture, agritech, butterflies, consult, container, dirt, dirty gardening, earth, eco, ecotech, farming, flowers, fruiting, garden, gardening, green, grow own food, growing, herbs, hobby, kitchen garden, mumbai, organic, plants, project, soil, sustainable, terrace, urban, vegetables on March 12, 2014 by Mandy. Yes! Thanks for the comment and general encouragement! Very inspiring. .can u help out in thane west. Thanks for writing in! I do not offer any consultancy services, but offer info on how easy it is to do it yourself! Do join our new facebook group – I’m sure you will find someone who would be willing to offer garden consultancy!